. "Emma-Jayne Wilson". The Canadian Encyclopedia, 24 July 2015, Historica Canada. https://www.thecanadianencyclopedia.ca/en/article/emma-jayne-wilson. Accessed 21 April 2019. Emma-Jayne Wilson concluded her studies at Guelph in 2002 and worked at a breeding farm for a short time before moving to Woodbine to assume a position as an exercise rider. Two years later Wilson was certified as an apprentice jockey, riding her first race in August 2004. Jockey Emma-Jayne Wilson celebrates her Queen's Plate victory, the first-ever by a Canadian female (photo by Cindy Dulay, courtesy Horse-Races.net). 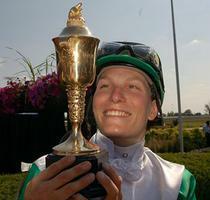 Emma-Jayne Wilson, jockey (b. at Bramalea, Ont, 1 Sept 1981). Emma-Jayne Wilson began riding at age 9. As an adolescent, with dreams of becoming a professional jockey, Wilson approached a trainer at Woodbine Race Track who predicted that she would be too big for the sport. Instead, she chose to attend the Kemptville College Equine program at the UNIVERSITY OF GUELPH, but a chance meeting with Canada's most renowned jockey, Sandy HAWLEY, renewed her passion for the sport. Hawley arranged for Emma to meet a trainer, who suggested she gain experience working with thoroughbreds prior to becoming a jockey. Emma-Jayne Wilson concluded her studies at Guelph in 2002 and worked at a breeding farm for a short time before moving to Woodbine to assume a position as an exercise rider. 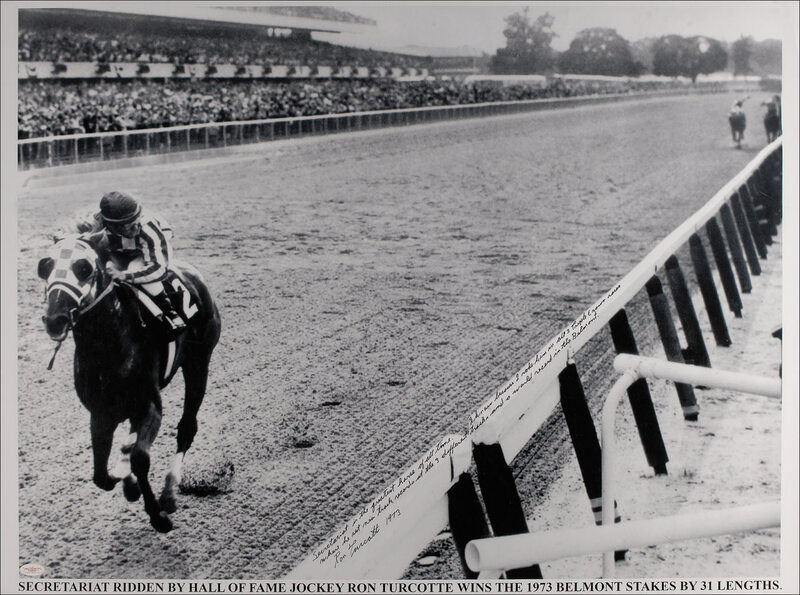 Two years later Wilson was certified as an apprentice jockey, riding her first race in August 2004. By December 2005 Wilson had won 175 races and earned more than $6.9 million in purses, leading the jockey standings at Woodbine and becoming the third-ever apprentice rider to do so. Following the 2005 season, Wilson was awarded the Sovereign Award for Outstanding Apprentice Jockey in Canada and the 2005 Eclipse Award for Outstanding Apprentice Jockey in North America. In early 2006 Wilson was invited to race overseas at the Dubai Duty Free Shergar Cup at Ascot in England. By year's end Emma-Jayne Wilson had amassed another 144 wins and once again won the Sovereign Award as the top apprentice rider. She was also inducted into the Brampton Sports Hall of Fame despite the hall's requirement that a jockey be retired for three years before induction, and she was named one of the most influential women in sport by the Canadian Association for the Advancement of Women and Sport and Physical Activity. 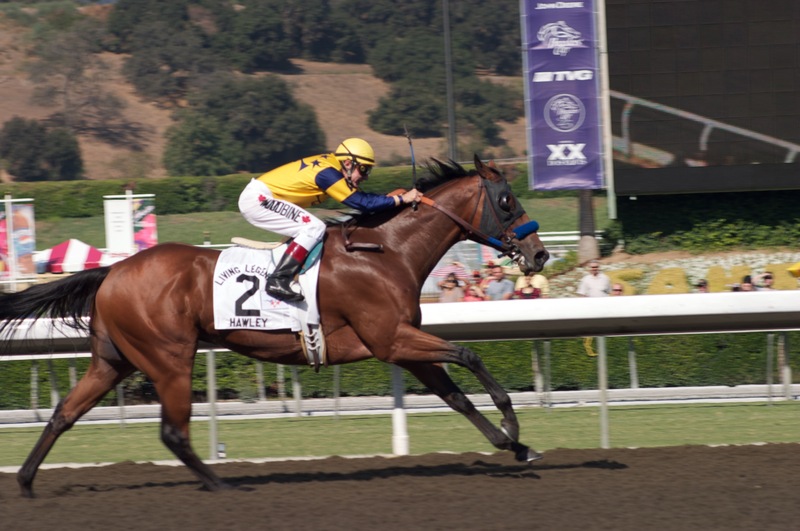 Emma-Jayne Wilson's biggest win came in 2007 when she became the first-ever Canadian female to win the country's most prestigious horse race, the QUEEN'S PLATE, aboard the thoroughbred Mike Fox, completing the 1.25-mile race in a time of 2:05.8. The best-ever finish by a female jockey in the event prior to Wilson's win was Francine Villeneuve's second-place finish in 1991. Emma-Jayne Wilson's talent as an internationally competitive rider was soon recognized: in late 2007 Wilson became Canada's first female rider to participate in the Cathay Pacific International Jockeys' Championship in Hong Kong, and in 2008 she became the first female rider in North America to be granted a licence to compete in Hong Kong.